John Cowan, also known as the Voice of Newgrass, has been singing his heart out for thirty-seven years now, and his soaring vocals have only improved with time. A true innovator, John applies his powerful pipes to genres from country, bluegrass, and gospel to soul, jazz, and rock-and-roll – often within the space of a single concert. His ability to move fluidly through multiple styles, and carry mesmerized audiences on the journey with him, has set him apart as one of the most loved and admired vocal artists of his generation, not just by fans and critics but among fellow musicians as well. With his distinctive, rock-tinged tenor vocal and heart-thumping electric bass, John, along with fellow New Grass Revival band mates Sam Bush, Courtney Johnson, and Curtis Burch, and later Bela Fleck and Pat Flynn, introduced a new generation of music fans to an explosive, experimental and ultimately, eponymous brand of bluegrass. The “newgrass” sound spawned popular jam bands such as Leftover Salmon and Yonder Mountain String Band in addition to shaping the sensibilities of country megastars Garth Brooks, the Dixie Chicks, the Zac Brown Band, and Darius Rucker. After New Grass Revival disbanded in 1990, John went on to record a series of critically acclaimed solo albums including Soul’d Out (Sugar Hill, 1986), the self-titled John Cowan (Sugar Hill, 2000), Always Take Me Back (Sugar Hill, 2002), New Tattoo (Pinecastle, 2006), 8,745 Feet, Live at Telluride (2005, re-released by E-1 Entertainment, 2009), Comfort & Joy (E-1 Entertainment, 2009), The Massenburg Sessions (E-1 Entertainment, 2010) and Sixty (Compass Records, 2014). Over the years, he also has been in high demand as a session musician and boasts vocal and/or bass credits on some 140 recordings, including albums by Garth Brooks, Glen Campbell, Rosanne Cash, Ashley Cleveland, Rodney Crowell, Steve Earle, Bela Fleck and the Flecktones, Hootie and the Blowfish, Janis Ian, Hal Ketchum, Alison Krauss, Delbert McClinton, Reba McEntire, Tim O’Brien, Mark O’Connor, Poco, John Prine, Kenny Rogers, Darius Rucker, Leon Russell, Darrell Scott, Ricky Skaggs, Travis Tritt, Hank Williams Jr., Jesse Winchester, Wynonna, Zac Brown, The Doobie Brothers and the Will the Circle Be Unbroken albums. In the early 1990s, John teamed up with Rusty Young of Poco, Bill Lloyd of Foster & Lloyd, and Pat Simmons of the Doobie Brothers in a country rock band called The Sky Kings. Despite the successful run of their CMT video “Picture Perfect,” the band’s recordings went unreleased due to a series of personnel changes first at RCA Records and then Warner Brothers, and the group was forced to call it quits in 1997. Shelved for years, The Sky Kings unreleased album, along with 14 additional tracks from the Warner Brothers archives, was finally published in 2000 by Rhino Handmade Records. Meanwhile, John’s alliance with Pat Simmons gained him a slot as bassist for the Doobie Brothers from 1992 through 1995 as well as a songwriting credit for “Can’t Stand to Lose” on the Doobie Brothers 2000 release Sibling Rivalry. Not content to remain a sideman, however, John left the Doobie Brothers to follow his creative muse in pursuit of a solo career that, at the dawn of the 21st century, found him circling back to his acoustic “newgrass” roots. 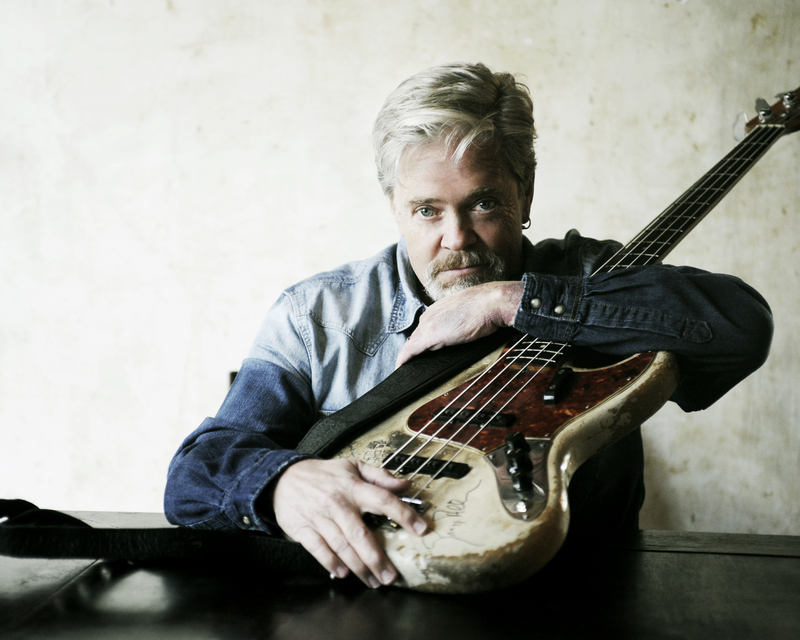 The John Cowan Band, in various incarnations that inevitably feature some of acoustic music’s finest players, has been a force to be reckoned with these seventeen years – and counting. John is a fixture and a favorite at major festivals like the Telluride Bluegrass Festival in Colorado and Wilkesboro, North Carolina’s “traditional-plus” MerleFest, and he routinely sells out performing arts theaters and distinguished music clubs and listening rooms around the country. Stints in his band have helped launch the careers of Noam Pikelny (Punch Brothers), Luke Bulla (Lyle Lovett), and Scott Vestal, among others. The band’s current lineup most often features long-time collaborator and outstanding flatpick guitarist Jeff Autry, renowned and in-demand fiddler Shad Cobb, and mandolinist extraordinaire John Frazier. John also is known for mixing it up; his creative collaborations range from his 2012 MerleFest performance alongside Darrell Scott and Pat Simmons to appearances with Nashville favorites The Long Players and Grooveyard. On his 2010 recording, The Massenburg Sessions, John joined forces with legendary producer George Massenburg (Little Feat, Randy Newman, Linda Ronstadt and others) to craft a collection that has the warm, intimate feel of a living room jam. It features duets with Maura O’Connell and Del McCoury. Longtime friend and co-writer Darrell Scott composed the haunting melody for John’s autobiographical ballad “Drown” (New Tattoo), a harrowing and graphic tale of childhood sexual abuse. The song led to John becoming the 2006 national spokesperson for Safe Place, an organization that provides and promotes safety and healing for individuals and families affected by sexual and domestic violence. “Drown” was also used in a video featuring John and others telling their stories to promote Nashville-based Our Kids, which provides medical evaluations and crisis counseling in response to concerns of child sexual abuse. It’s an issue close to his heart and one about which he remains vocal. And as if John wasn’t busy enough, in March of 2012, WSM Radio – home of The Grand Ole Opry – launched John Cowan – I Believe To My Soul, an hour-long radio program that aired monthly for two years and featured John interviewing and playing the music of some of the giants and legends of contemporary music. For example, his first guest was Leon Russell, whose catalog of songs includes timeless classics like “Masquerade” and “A Song For You,” and whom Elton John names among his biggest influences. Over the two years I Believe To My Soul aired, it featured John’s former New Grass Revival band mate and world-renowned banjo innovator Bela Fleck; beloved singer-songwriter Rodney Crowell; Justin Hayward, lead singer and songwriter of Moody Blues fame; Gordon Stoker of the Jordanaires; Country Music Hall of Fame members Loretta Lynn and Kris Kristofferson; Chicago founding member Robert Lamm; legendary singer/songwriter/producer Jim Messina; John Carter Cash; acclaimed singer/songwriter/producer Wendy Waldman; Eagles founding member Bernie Leadon; Rock & Roll icon Bonnie Bramlett and Rock & Roll Hall of Fame member Sam Moore. These days, John Cowan fans have to wait a little longer between shows and possibly travel a little farther to get to them. That’s because he’s working his own performances into and around another very busy schedule. In 2010, the Doobie Brothers found themselves once again in need of a bass player, and John Cowan was the first person they called. He took the job, and now he travels the world with the Doobies, laying down the low notes and singing the high ones as they perform hits such as “Black Water,” “China Grove,” “Taking it to the Streets,” and “Listen to the Music” as well as new songs that showcase the relevancy of this iconic classic rock band. John was also featured as a background vocalist on the Doobies latest album Southbound, released in 2014.